00:04 Joel Harford: Hi, welcome to the Two Journeys podcast. This is Episode 5 of Bible Study Questions in Philippians. Today, we're going through Philippians 3:1-11. I'm your host, Joel Harford, and I'm here with Pastor Andy Davis. Andy, this is one of the more famous sections of Paul's writings where he says he renounces all things and counts them as rubbish so that he can know Christ. Can you give us a brief overview of this section? 00:32 Pastor Andy Davis: Yeah, Paul is decisively turning his back here on a righteousness that is gained through self-effort, a righteousness that is gained by obeying some religious laws, rules and regulations, and in so doing really turns his back on every religion in the world, except biblical Christianity. Biblical Christianity points to the finished work of Jesus Christ on the cross, and his powerful resurrection from the dead, whereas every other religion commands you to behave in a moralistic or a spiritual or religious way, and based on your performance are your sins forgiven and you are welcomed in that religion. And so this is a decisive chapter in which Paul is saying, he's pursuing a righteousness that is given simply by faith, and not by works of the law. 01:20 Joel: A righteous that is by faith. That is the crux of Christianity. 01:28 Joel: Well, for the sake of our audience, I'm going to read Verses 1-11 and then we'll discuss them. "Finally, my brothers, rejoice in the Lord. To write the same things to you is no trouble to me and is safe for you. Look out for the dogs, look out for the evildoers, look out for those who mutilate the flesh. For we are the circumcision, who worship by the Spirit of God and glory in Christ Jesus and put no confidence in the flesh, though I myself have reason for confidence in the flesh also. If anyone thinks he has reason for confidence in the flesh, I have more: Circumcised on the eighth day, of the people of Israel, of the tribe of Benjamin, a Hebrew of Hebrews; as to the law, a Pharisee; as to zeal, a persecutor of the church; as to righteousness under the law, blameless." 02:22 Joel: "But whatever gain I had, I counted as loss for the sake of Christ. Indeed, I count everything as loss because of the surpassing worth of knowing Christ Jesus my Lord. For his sake I have suffered the loss of all things and count them as rubbish, in order that I may gain Christ and be found in him, not having a righteousness of my own that comes from the law, but that which comes through faith in Christ, the righteousness from God that depends on faith. That I may know him and the power of his resurrection, and may share in his sufferings, becoming like him in his death, that by any means possible I may attain the resurrection of the dead. 03:06 Joel: So Andy, before we get into this part, this beautiful part about Paul renouncing everything, there are some things in the beginning. First of all, just the command to again rejoice in the Lord. Why does Paul keep having to remind his readers of that? And then why is joy so important in the Christian life? 03:21 Andy: Yeah, and he's going do it again in the next chapter, he's going to remind them again and again, and the more famous statement in Philippians 4:4, "Rejoice in the Lord always. I will say it again, rejoice." And even that, the first one was a repetition. He goes over it again and again. I think it's because this world is a dreary sad, distressing place to live in, and we're constantly assaulted by the world of the flesh and the devil, and joy in the Lord is one of the things that gets hammered day after day, and sometimes we have to be reminded of all the riches that we have in the Gospel, and reminded of the hope that is ours in Christ so that we can be evidently, obviously buoyant in hope. And so, that lost people who are watching us, we’re shining like stars in the universe, as we hold forth the word of life, as Paul said in Chapter 2, that they will ask us to give a reason for the hope that we have. 04:10 Andy: So we want to be filled with joy because God just wants us to have the gift of joy, but we have to be reminded of it. And so, right at the beginning, he says, "It's no trouble for me to write the same things to you. And it's safe, or a safeguard, or a protection for you." And this just shows the necessity of repetition in a good teaching and preaching ministry. 04:31 Joel: So I know it's not the focus of this section of the letter, but can we talk about how that could be really an admonition to be part of a local church, because one of the things we do regularly week after week is to remind each other the Word of God. 04:45 Andy: Well, it's a beautiful thing that the "city of truth" as I called it in the book, An Infinite Journey, is just getting built in our souls, line upon line, precept upon precept, sermon after sermon. And it doesn't change, it doesn't radically get rearranged, it doesn't get uprooted, there's a foundation laid and little by little, we start to get more and more a sense of this magnificent city of truth. So what that means is, if you've been a Christian any length of time, if you have listened to many sermons and read many Christian books, you've got a very good solid foundation of orthodox Christianity, of biblical doctrines. It's not going to get uprooted day after day, you're not going to be starting from scratch every day. 05:30 Andy: So what that means is, overwhelmingly the majority of things, good things that you hear, you will have already heard them. You will have already learned them, you're just hearing them again. The reason, however, we need to hear them, is we forget. Our minds are forgetful, we get distracted, we get discouraged, and we need to be reminded, again and again, of things we have already heard. 05:51 Joel: Yeah, I think sometimes when we are reminded, we remember that we knew that, but then we realized we haven't been living according to that. 05:57 Andy: Sure, yeah, absolutely. 06:00 Joel: Now, what about this warning in Verse 2? Very strong, he says, "Look out for the dogs, look out for the evil doers, look out for those who mutilate the flesh." Who is he talking about? 06:11 Andy: Well, he's going to talk a lot more about them in the Book of Galatians than here in Philippians, but I think he's talking about the Judaizers, or those that were addressed in the council in Jerusalem in Acts 15. These were people who were Jews/Jewish people, who were teaching that the Gentile converts to Christ had to be circumcised and required to obey the ceremonial laws of Moses in order to be saved. And that was a false teaching, it was a false gospel. Paul calls it in Galatians a gospel which is no gospel at all. It's a gospel of self-righteousness through works of the law. And so, he's warning these Philippians that these teachers are on the loose, and they need to not give in to them for a moment, they need to continue in freedom, in Christ, that Christ has set us free from legalistic regulations, and that our righteousness comes by faith alone, and not by works of the law. 07:10 Andy: So, he's urging them to be on their guard against these false teachers. It's up to the local church what kind of teaching it puts up with. And so just like in Galatians, he's very sharp with the Galatians. He calls them foolish Galatians, for putting up with this kind of false teaching. So these Philippians again, he doesn't develop it here much, but he does say, "Watch out for false teachers who come in and say that unless you follow the law, you cannot be saved." 07:35 Joel: And if you'd like to see more about that, see also Acts 15:1 and Acts 15:5, in the Jerusalem Council. Now, what does Paul say about true Christians in Verse 3? 07:49 Andy: He says, in light of that issue of circumcision, he says the real circumcision, (he's going to say the same thing in Romans Chapter 2) is a circumcision of the heart by the Spirit, not by the written code. That's the true work of the Holy Spirit. There are just different ways of talking about the same thing: Being born again, having the heart of stone removed and the heart of flesh put in, a transformed nature by the Spirit. This is the circumcision. The old nature of wickedness cut out and removed from us by the ministry of the Holy Spirit through the Gospel. And so that's what he means when he says, "We are the circumcision." The "we" there are true believers in Christ, Jews and Gentiles alike, those who have been born again by the Spirit. We are really the circumcision, we are truly the sons and daughters of Abraham, that's what he's meaning there. 08:38 Andy: We are those who "worship by the Spirit of God, and glory in Christ Jesus and put no confidence in the flesh." I heard once John McArthur say that this is the greatest single verse definition of a Christian in the Bible. It's got three aspects to it, it's very powerful. We worship by the Spirit of God. I think specifically, we worship the Triune God, Father, Son, and Spirit by the power of the Holy Spirit, our worship is not rules made up by men, but it's an inner moving of the Spirit to worship God. We worship by the Spirit of God. We glory or boast in Christ Jesus. And I actually want to put those two together, we actually worship Christ and boast in him by the Spirit. The Spirit compels us to worship Jesus Christ as God, and so we put all of our confidence and our trust in Christ, in his righteousness, in his death on the cross, and his resurrection. We boast in Christ Jesus, as it says in 1 Corinthians 1:31, "As it is written, 'Let the one who boasts, boast in the Lord.'" That is, in the Lord Jesus Christ. 09:41 Andy: And the third part is, we "put no confidence in the flesh." We're not trusting in unaided efforts, we're not trusting in our own legalistic righteousness, we're not trusting in our own good works, like giving to the poor and needy, or our prayer lives, or our fasting. We put no confidence in what the flesh, the unaided natural ability, can do. So that's what a true Christian is. 10:03 Joel: I love it. Now, he gives his spiritual resume, he starts listing off the things that he's done. It's kind of strange to us to hear Paul, the guy who says, "Far be it for me to boast in anything but the cross," but then, occasionally, he'll give his resume of things he's done in the past. Why is he doing this? 10:21 Andy: Well, I think in this way, he's speaking on behalf of people who would be tempted to boast in their religious achievements, and he's saying that this kind of arrogant boasting is something that people inevitably do when they're trying to be justified by works, they're trying to be made right with God by their works. And he says, "I understand that mentality completely. I was like that for most of my life, I was a law-abiding Jew. I was thoroughly zealous for the law." He says, he sat at the feet of Gamaliel, and was being trained, he was deeply zealous for the traditions of the fathers, and he was advancing (he says in Galatians) in Judaism, beyond any of his age, he was very competitive. He's a competitive man. 11:05 Andy: And he's saying, "Look, if anybody on planet Earth had reasons to put confidence than the unaided natural ability spiritually, it would have been me. But I found all of it was lacking." And so that's what he means. If anyone has reasons for confidence in the flesh, I actually have more. And then he gives his resume here. 11:25 Joel: So we see people do this all the time, giving the reason, really their confidence in the flesh, maybe the moralistic way they live… Not just in Judaism or Christianity, but in any religion… The idea that if you follow with your whole heart, with sincerity, then that's commendable, but Paul seems to be rejecting that too. 11:47 Andy: He absolutely does reject it. First of all, Paul would have rejected all non-Christian religions or anything that does not stand from the God of Abraham, Isaac, and Jacob, that does not come from the Law of Moses and the prophets, any non-biblical religion, he would have seen as demonic, he would have set it aside. So any good works done by Buddhists or Hindus or Muslims, he would have set it aside as a false teaching entirely. But now he's dealing with Jews who were following the teachings of Moses, (so they thought anyway), and they were following the traditions that had come down through Abraham, Isaac, Jacob, through David and Solomon, and through all the prophets. They were following in that revealed religion, but doing it on their own. Doing it through their own self-efforts, trying to prove their own righteousness by the law. 12:42 Andy: In other words, the law gave them a chance to show what good men and women they were. That's what he's talking about here. So he's saying, "Of anyone that could have boasted," setting aside all the worldly pagan religions (they're gone), you're left then only with the revealed religion of the Jews because Jesus himself said, "Salvation comes from the Jews." So through that lineage of anyone following that way, I would have had a greater claim to self-righteousness than anyone I know. It's quite a bold statement. And then he lists his things here. Circumcised on the eighth day, so that's in accordance with the commands given to Jewish fathers. His father was a law-abiding Jew, who had him circumcised on the eighth day, therefore he was part of the old covenant, part of the Mosaic covenant. 13:26 Andy: He was of the people of Israel, he was descended from Abraham, Isaac, and Jacob. He was a Jewish man, and he was of the tribe of Benjamin, that was one of the good tribes, one of the ones that allied together with Judah, and was tried to remain faithful to the Levitical priesthood, and had a good reputation, The tribe of Benjamin. He calls himself a Hebrew of Hebrews. In other words, I was the quintessential Jew. If you were looking for anyone on planet Earth who was the true Hebrew, it would have been me. In regard to the law, I was a Pharisee. They were a specific sect that sought to be meticulously accurate about every aspect of the law of Moses. 14:03 Andy: They took everything very, very seriously. And for zeal, he says, "I went above and beyond all the Pharisees. I made it my life goal to destroy this upstart Church of Jesus Christ. I was persecuting the church. I was dragging off men and women, and throwing them in jail. I obtained letters from the high priest to go to the synagogue in Damascus, so that if I found anyone there who was following this sect, this... Following this religion of Jesus, I would have dragged them back to Jerusalem and had them punished. So I was highly zealous, and concerning any kind of righteousness that could come through the law, my conscience was clear, I was blameless." So that's his spiritual resume. 14:43 Joel: Okay, so Paul has these spiritual credentials, he's the Pharisee of Pharisees, and he trades it all in. He trades it all in, so that he can know Christ. What's going on with this? 14:58 Andy: What happened was the road to Damascus, it changed everything. He was on his way to the synagogue in Damascus, he was breathing out murderous threats against the Lord's disciples, he was hostile to Jesus, he was opposed to everything, and then suddenly, a supernatural, a blinding glorious light from heaven, changed his world. And he heard a voice in the midst of that light saying, "Saul, Saul, why do you persecute me?" And he asked the question, an amazing question, "Who are you Lord?" He already knew who he was, he was the Lord. Of course, he was. It was clear that this was a... This was God speaking to him. 15:33 Andy: "Saul, Saul," he knows his name. "Why do you persecute me?" "Who are you, Lord?" And then came the answer that changed his world. "I am Jesus. The one you are persecuting." That changed everything. At that point, Jesus was not a dead deceiver of the people, but a resurrected, glorified God in the heavens, who could have killed him on the road to Damascus, but instead, said "Now, get up and go into the city and you'll be told what you must do." And he was blinded by that light, he could not see, he was fasting, he was praying, and trying to work through the implications of the glorious person who he saw, and the statement, I am Jesus, that changed everything. 16:22 Andy: And he realized, as Jesus himself said, "Unless your righteousness surpasses that of the Pharisees and teachers of the law, you will by no means enter heaven." He knew his righteousness was inadequate, that if he clung to that righteousness, he would be condemned. Actually, he deserved to be struck dead because he had been persecuting the Son of God and his followers. 16:46 Joel: Wow. So in view of this vision of Christ, realizing that Jesus is the ascended Lord, he says he counts or considers or reckons everything else as loss or rubbish. 17:02 Joel: What does this mean? And how do we now, 2000 years later, followers of Jesus in the steps of Paul, how do we count all of our deeds as rubbish? 17:12 Andy: Yeah, he's really using kind of a business accounting language here. Like accountants would have used back then. You've got profit and loss. And anyone in business would seek to be in the black, you'd seek to be making a profit and not in the red, which is losing money. And so anything that was in the red was a liability, was a loss to you, as he looked at all of his personal righteousness, if he looked at all of his mentality and his approach to life, he realized it was no help to him and actually was condemning him through self-righteousness. Because the Scripture says very plainly, "God opposes the proud, but gives grace to the humble." He knew that he could not be saved with this, and so he had to turn his back on it, it was actually hindering him in understanding the true righteousness of Christ. He was so proud, so proud of himself, so proud of his achievements. So much trusting in himself, but he came to realize that none of his good works could ever pay for his sins, and he actually had many sins. 18:13 Andy: David himself said, "My sins are more numerous than the hairs of my head." So he was greatly underestimating the perfection of the Law of God, and his own wickedness in the sight of God. And so he realized he now needed to reckon or, as you said, consider all of his righteousness as actually, to some degree, wickedness. It was actually sin because of the prideful demeanor with which he was doing all of it, he had to consider it that way. So what it teaches me is, how you consider your works, what you're thinking about when you do your good works, whether you're trusting in them to pay for your sins, all of these things matter, and you actually have to turn away from that and consider all of those things as though they were rubbish. That's what Paul says here. 19:00 Joel: Yeah, renouncing self-reliance, renouncing any trust on anything you did and wholly leaning on Christ. 19:06 Andy: He says, "I consider everything a loss compared to the surpassing greatness of knowing Christ Jesus my Lord, for whose sake I have lost all things." There is nothing greater than knowing Christ as Lord. There is nothing greater than discovering Christ in whom are hidden all the treasures of righteousness and wisdom as he says in Colossians. To know him, it's an infinite journey. You will never finish study in Christ. And so he just had his appetite wet there on the road to Damascus. He had a glimpse of heavenly glory, and he yearned for more, he just wanted to see that sight again. All he wanted, every fiber of his being was, "I want to know Christ." Everything that hinders me from knowing Christ is a loss, it's rubbish compared to what he calls the surpassing greatness of knowing Christ Jesus my Lord. 20:02 Andy: And then he says, "For whose sake I have lost all things." He turned his back on a lucrative career, just like Matthew, the tax collector got up and walked away from a lucrative business as a tax collector, walked away from all that money, all that comfort and ease. Paul did the same thing in his life, he turned away from a life of political power within that Jewish religious structure. The upward mobility, the finances that came… Annas and Caiaphas were incredibly wealthy, powerful men. He turned his back, he angered them, they wanted to hunt him down and kill him, so he turned his back on all of those things because he wanted to know Christ. So he has lost all things, he lost his freedom, he lost his possessions, he lost his health, he lost the esteem of unsaved relatives and countrymen, he lost much for following Christ. 20:52 Andy: But as David Livingston said, he was a missionary to Africa in the 19th century, "I never made a sacrifice." He said, "When I compare what I've given up to what Christ gave up and then what I have received in following Christ, it's wrong for me to even talk about sacrifice." 21:07 Joel: Well, that was my next point. Going beyond the spiritual resume and going to the financial aspects, and material things, if we Christians, when we come to Christ, basically consider (in accounting terms), everything we have is loss, then if Christ chooses to take it away, (like in Hebrews he says, "You joyfully accepted the plundering of your property because you knew that you yourselves had a better possession,") we've already written it off and counted it as loss, we can joyfully endure hardship. 21:37 Andy: Yeah, that's one of the hardest lessons that there is and Paul's going to address it right in this very text, learning how to die, learning how to be conformed to Christ's death and how little by little by little to consider every moment a loss given over to the purpose of God even to the point of great suffering. I mean, I think in all of church history, no one suffered as much as the apostle Paul. No one else that I know of was beaten eight different times, five times with the 39 lashes, three times with rods, was stoned to death, so that's nine physical assaults on his body. As he said in another place, "Let no one cause me trouble from now on, for I bear on my body the marks of Jesus." 22:20 Andy: These were scars, and the effects of these woundings. Then shipwrecked multiple times, poverty dogged him, imprisonment, torture, just again and again sufferings. And when we look at that, you think about the suffering that he went through and all he wanted was to serve Christ day after day. Very few of us, western Christians, American Christians go through that level of suffering. However, some of our brothers and sisters in Muslim countries or communist countries or other places have had to suffer much for their faith in Christ. 22:55 Joel: Yeah, it's truly remarkable. Now Paul, in this section, he seems like he knows Christ but he's still striving to know Christ, he says "That I may know him and be found in him." I think another translation says, "I want to know Christ," but he already does know him. So, how do we understand that? 23:17 Andy: Well, again, I think it's because Jesus is God. He's the second person of the Trinity. He is an infinite topic. We will never exhaust the riches of knowing Christ and so I think in heaven we will forever be learning Christ. That's why it says in Isaiah 9, "Of the increase of his kingdom and of peace, there will be no end." His kingdom will just keep on increasing, even though babies are not being born, even though the population isn't increasing because the redeemed that have been saved from every tribe, language, people, and nation will continue to study Christ even in heaven. But a genuine Christian, who's begun that journey has already tasted and seen that the Lord is good, and wants more of that. 24:02 Andy: And so he just says, "I just want to know Christ, all I want is to know him." Now, here's the man that wrote the Book of Romans. I mean, nobody on planet Earth has ever known as much Christian doctrine as the apostle Paul. But the more he knew, the more he wanted to know Christ and so it just began on the road to Damascus, began an eternal quest for knowing Christ, especially as Christ revealed the Father to him. 24:28 Joel: Yeah, wow. Now, I actually jumped ahead to verse 10, I forgot about verse 9 where Paul talks about not having a righteousness of his own that comes from the law. So there was a certain kind of righteousness that he thought he had beforehand, but now he has a righteousness that is not from himself. Martin Luther talked about the alien righteousness. So what is this righteousness that comes from God? 24:52 Andy: That's imputed righteousness. It's the righteousness of the Gospel that if you believe in Jesus Christ as your Lord and Savior, trusting in his death as a substitute under the wrath, the just wrath and penalty that comes from God for our sins that he is our substitute, and that his perfect righteousness, his obedience, his active obedience to the law of God is given to us as a gift, and our sin is credited to Jesus and he dies in our place, that double imputation or double exchange, our sins on Jesus and he dies, his righteousness given to us and we live, that's the righteousness of the Gospel. 25:33 Andy: He had (Christ) would have to say, in Luther's language, an alien wickedness. He didn't do anything evil or wrong, he committed no sin, there was no deceit found in his mouth, but God made him who had no sin to be sin for us, that's the alien wickedness, I mentioned a moment ago, so that in him we might become the righteousness of God, that's the alien righteousness that we have, and in that righteousness alone, we will survive Judgment Day. And so, what he wanted, what Paul wanted was to turn his back on his Jewish legalistic righteousness, turn his back on that life of proving how good a man he was by the law of God, turned his back on all of that as though it were decaying rotting rubbish, it would not help his soul, it would actually condemn his soul on Judgment Day, turned his back on that, so that he might gain an imputed righteousness. 26:23 Andy: You have to give up the one so you can receive the other. You can't trust in both, you can't say, "Well, I'm trusting in Jesus and in my own good works." Paul gave up on that, and just all he wanted was the imputed righteousness of Christ. Justification by faith, that's Verse 9. 26:38 Joel: I just, I love the doctrine of imputed righteousness. It's actually my, probably my favorite of all Christian doctrines. Though if we talk about other things, I may have some other favorites as well, but I think that has powerful implications for the Christian life, because, we talk a lot about sanctification and the struggle with sin. And if you're trusting your own righteousness, you know, even in error, and you're in sin, there's condemnation, it's depressing. But then if you remember that my righteousness is not my own, it's all from Christ, it's incredible for the Christian life. 27:10 Andy: Absolutely. And our podcast here is the Two Journeys podcast, and this may be one of the key chapters in the whole Bible in the Two Journeys because he's talking here about that imputed righteousness, that's justification. But then the rest of the chapter is given over to the internal journey of holiness. And it actually starts in verse 10 here, "I want to know Christ and the power of his resurrection." So that's something he doesn't have yet. I want to become "like him in his death," that's sanctification. And so somehow in that way to attain to the resurrection from the dead. So that's that internal journey of the infinite journey. So we call it of sanctification. You get them both here, you get justification and sanctification. And the rest of the chapter, he's going to be talking about sanctification. 27:54 Joel: So let's talk about the sufferings, sharing in the sufferings of Christ. How do we do this? 28:00 Andy: Yeah, well, this is the hardest part of the Christian life. There is actually nothing harder than learning how to die, to deny yourself, to take up your cross daily, to deny yourself and to die to what you want to do. I mean in your marriage, like Joel when you get home and your wife wants you to do something you don't want to do it and you know the Lord wants you to do it and you fight, your flesh fights against it. Or you've got kids and they have needs, middle of the night. And that flesh, as we've said before, is the fanatical commitment to self-interest, that's the very thing we're going to be fighting the rest of our lives and we have to learn to die, to die like Jesus did. 28:37 Andy: I want to be conformed to Jesus' death. His death as Paul says in Romans is a death to sin, once for all. But to learn how to live that out, day after day after day, to die to sin, to be dead to sin. Paul says I have to learn that. I have to learn how to die. And I think about the time that Paul was stoned to death it seems, and God may have actually even physically raised him from the dead, gets himself up out of a pile of rocks and then goes and continues to preach the Gospel. I'm sure every fiber of his being wanted to break a vacation at least to heal, but instead the Lord through the Spirit compelled him to continue running his race with endurance and to keep preaching the Gospel. As he said, "I consider my life worth nothing to me, if only I may finish the race and complete the task the Lord Jesus has given me, the task of testifying to the Gospel of God's grace." 29:27 Andy: So the external journey of Gospel advance, you have to die to yourself to do that, to witness to somebody sitting next to you on the airplane or to a co-worker or an unsaved relative and to know that they're probably going to reject, you just have to die to yourself. One other verse comes to mind, and that's in John Chapter 12, I think it's Verse 24, "Unless a kernel of wheat falls into the ground and dies, it remains by itself a single seed. But if it dies, it brings forth much fruit." We have to learn how to die. And as I said, it is the single hardest lesson there is in the Christian life. 30:00 Joel: I think it is. I was thinking about this the other day, and I'm curious to know what you think of it, that it is much easier to die for Christ than to live for Christ. And what I mean is, maybe give myself in martyrdom or face the gallows or the Roman Colosseum, and then it's over. But to live for Christ is to every day fight that war against sin, every day put on courage to do evangelism to live the Christian life. 30:28 Andy: Well, I'm going to pick up on that. And I think Paul combines the two by saying that we should present our bodies as a living sacrifice, and the Jews would have seen the sacrifice as something dead. So we have to do a living death, that's really what it is. That in dying, we live, that's really what it is. Whoever saves his life will lose it, but whoever loses his life, continually loses his life, will find it for eternal life. So Paul uses it in another phrase, he says, "I die every day. I mean this brothers." He says it very plainly, "I die every day." Now, he doesn't mean he dies physically, but he dies to himself, he dies to what he would prefer into his own reputation. So here, what he's saying is, I want to become increasingly conformed to the death of Christ. That's a lifetime goal, that in that death I might find Christ. 31:17 Andy: The author of the Hebrews also says, "Let us go out to him bearing the reproach he bore for he was crucified outside the gate." And that's a symbol of rejection, societal rejection, where the Jews put Jesus on the outside of Jerusalem as though he was a piece of refuse and the author of the Hebrews says, "Let's go to him outside the gate bearing the reproach he bore." 31:38 Joel: Now, lest anyone think this is real dreary, this is actually the most joyful life you can live, right? 31:44 Andy: There's none better. And we know that, and whenever we do die to ourselves and serve someone… Like let's say there's somebody with a chronic illness and you forget what you want and you care for that needy person, you do find a joy, a secret joy in your life, to know that I'm not living a selfish life right now, I'm really living to serve others. So it is the best life you can find, but the flesh is constantly rising up and saying, "No, it's not. No, it's not. It'd be so much better if you just do what you wanted." So we got to fight this every day of our lives. 32:13 Joel: Now, one more question from the text, verse 11, Paul says, "That by any means possible I may attain the resurrection of the dead." How was the resurrection really more valuable than anything we could have in this life, and really anybody who's not thinking about the resurrection of the dead is actually a fool. 32:32 Andy: Absolutely. Well, the resurrection of the body is the consummation of individual salvation. That's the finish line. That's when we have received everything that the Gospel can give us and that's that full salvation. We're rescued from the death that we got in Adam and the death, the wages of sin is death, and we have received a mighty resurrection body conformed to Christ. He, the first fruit, and we, the rest of the harvest, were part of that. We will have a glorious resurrection body described in 1 Corinthians 15. The body that is sown, it's sown in weakness, it's raised in power, it's sown in dishonor, it's raised in glory. It's sown in suffering and pain, it's raised to never again experience any death, mourning, crying, or pain. It is a glorious resurrection spiritual body. 33:20 Andy: And if we could somehow attain to that, now when he uses that language, "so, somehow, or if by any means," what he's saying, it's not that he is not certain he is going to receive the resurrection of the body, it's been promised to him, but he's not done being saved, he's got a race to run, and he's got to be striving. As he's going to say in the rest of the chapter, forget what lies behind, press on, strain on toward what lies ahead, to be conformed more and more to the death of Jesus. There's a race to be run, and the finish line is the resurrection from the dead. 33:52 Joel: I love it. Do you have any final thoughts in Verses 1-11? 33:56 Andy: Absolutely, I think we need to, first and foremost, continue to turn away from our spiritual resumes. Whenever you sin, if you have sinned, if you've violated your conscience, you know you've done something wrong, the answer is not go do a bunch of good works, the answer is humble yourself and receive again, renew yourself again in the righteousness that comes from God and is by faith in Christ. So just go to the cross and find all of the forgiveness in the righteousness you need there and keep saying to yourself, preach the truth to yourself, I am perfectly righteous in Christ by faith alone, not by works, but also beyond that press on to learn how to die, press on to learn how to die to yourself, to die to your lusts, to die to your sin nature and your selfishness and even amoral pleasures, to learn to not live for them but to say I want to learn more and more to live for Christ and for his kingdom. So that's the advice that flows to me from these incredible verses. 34:53 Joel: Well, thank you, Andy. And to our audience, thank you for listening to the Two Journeys podcast. 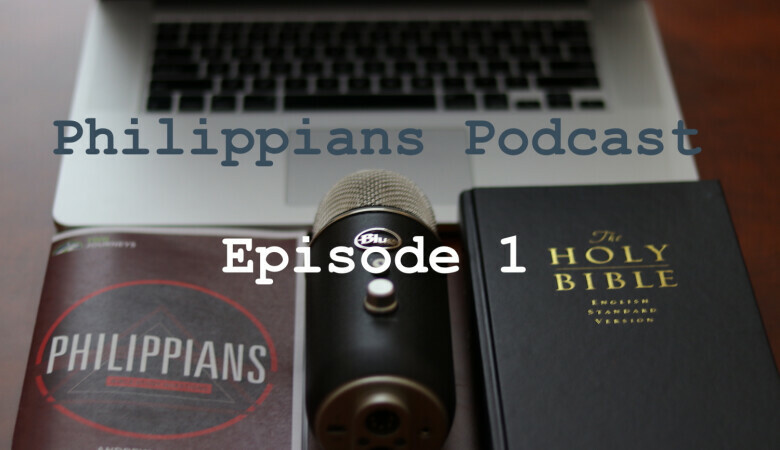 This was Episode 5 in Bible Study Questions going through Philippians. Please join us next time and we'll look at Philippians 3:12 through Chapter 4:1, pressing on toward perfection in Christ. Thank you for listening and God bless you all. Thank you for listening to this resource from twojourneys.org. Feel free to use and share this content to spread the knowledge of God and build his kingdom, only we ask that you do so for non-commercial purposes and in accordance with the copyright policy found at twojourneys.org. Two Journeys exist to help Christians make progress in the two journeys of the Christian life, the internal journey of sanctification and the external journey of Gospel advancement. We do this by exporting biblical teaching for the good of Christ Church and for the glory of God.